Reuter’s reports two additional developments in the Ebola outbreak in America. The family of Dallas contaminant, Eric Duncan, has been quarantined for the 21-day confinement period in their own home. None have shown signs of infection at present. Duncan remains in serious condition as he struggles against the virus. Dallas officials report that possibly scores of people were exposed to Duncan, including 18 -20 who had direct contact, and untold scores who had contact with the 18-20. Read more. 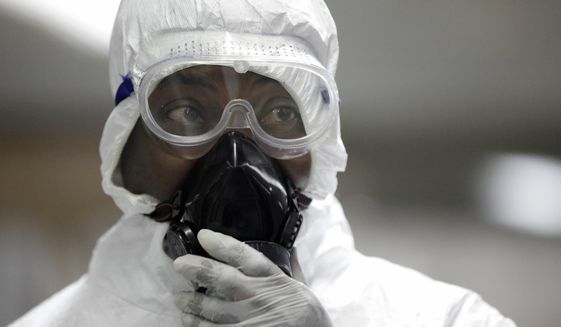 In a another development a free-lance photographer for NBC News tested positive for the virus while working in Liberia. After feeling ill and a slight fever, he quarantined himself, and then was seen by Doctors Without Borders. Twelve days later, he tested positive. The entire NBC team has been flown back home by private charter where they will be quarantined for the 21-day incubation period. Read more. In related reports, Reuters reports of a Uganda physician who has contracted the virus and has been flown to Germany for treatment. The article reports that over 3,300 have been identified as dying from the virus. Many unreported deaths take the count much higher. Read more. “Time for panic? Absolutely not,” the Dallas Morning News said in an editorial on Wednesday, echoing many in the fourth-largest U.S. urban area, home to nearly 7 million people. “We would not wish this deadly virus on any country but no nation in the world is better equipped to respond faster and with greater medical expertise than ours,” it said. Read more. The Washington Times reports that Obama Administration has rejected calls from within the U.S. on travel restrictions to or from those African countries most impacted by the virus. Read more. I wonder how many 21-day incubation cycles it will take before all Americans fall to their knees and implore the Great Physician for mercy from this pestilence. Revelation 6:8, 16:11. Egypt’s Military – How long at the wheel?